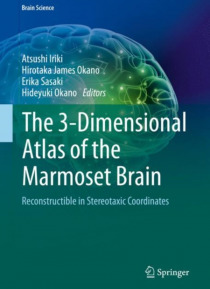 This book provides accurate, comprehensive, and convenient reference for usages of the "e;freely rotatable three dimensional combined Nissl-stained and MRI digital data of the marmoset brain"e;. The key features of the original 3D digital data and of this atlas are: 1. The original digital datasets are freely rotatable in three dimensions, thus expected to be useful for any disciplines and… anatomical interest, using any coordinate system, 2. Combined Nissl stained and MRI images are obtained from the same marmoset, to allow cross-modality matched references for multiple usages, 3. 86 Horizontal Series of Images with Neurosurgical Plane (based on the actual data), with more accuracy and resolution (Chapter 2) than the web-based digital images, 4. 32 Coronal Series of Images with Neurosurgical Plane (reproduced from the brain model) (Chapter 3), 5. 10 Parasagittal Series of Images with Neurosurgical Plane (reproduced from the brain model) (Chapter 4), 6. 3 Omnidirectionally Sliceable Planes (reproduced from the brain model) (Chapter 5), 7. In order to provide higher resolution structures to match systematic accuracy for supplementation of the digital data on the website, additional information are included. They are: 1) Nomenclature, 2) List of Brain Structures in Hierarchical Order, 3) Index of Abbreviations, together with 143 useful Bibliographic References list as of 2016, 8. Horsley-Clarke's stereotaxic coordinates were adopted in the present atlas.